Third Lake, IL - The earthly remains of Protojerej-Stavrofor Milan Savich arrived at New Gracanica Monastery in Third Lake, Illinois in the late afternoon of Tuesday, November 30, 2010 and were received at the Monastery Church by His Grace Bishop Longin of New Gracanica-Midwestern America, who, along with the priests and deacons present, served a Pomen. 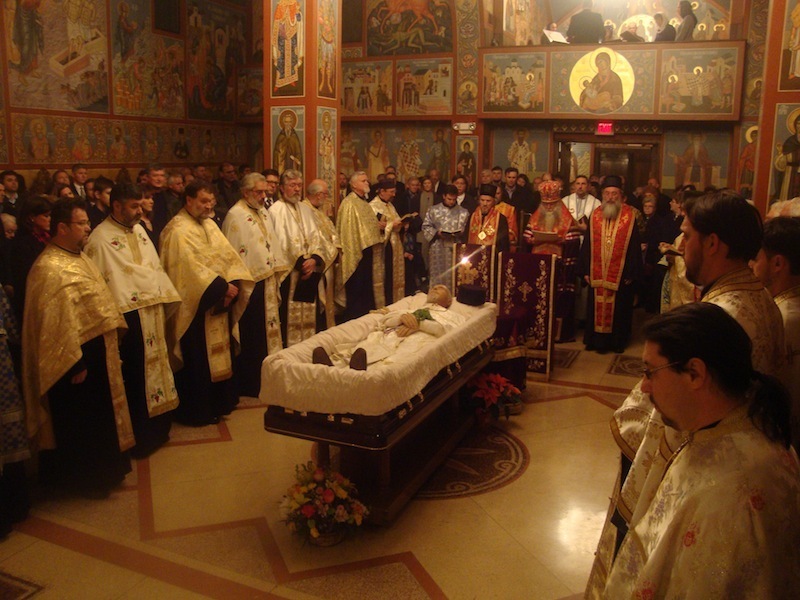 Prota Milan’s body was vested in white vestments made in his native land, at Vavedenje Monastery in the Morava river valley of Ovcar-Kablar, known among the people as the Serbian “Sveta Gora/Holy Mountain.” Vesting had taken place in Northwest Indiana, where Prota Milan’s son Jovan is a funeral director, by Protojerej Dobrivoje Milunovic, Jerej Marko Matic and Jerej Aleksandar Novakovic, all three of whom as seminarians had trained with Prota Milan. 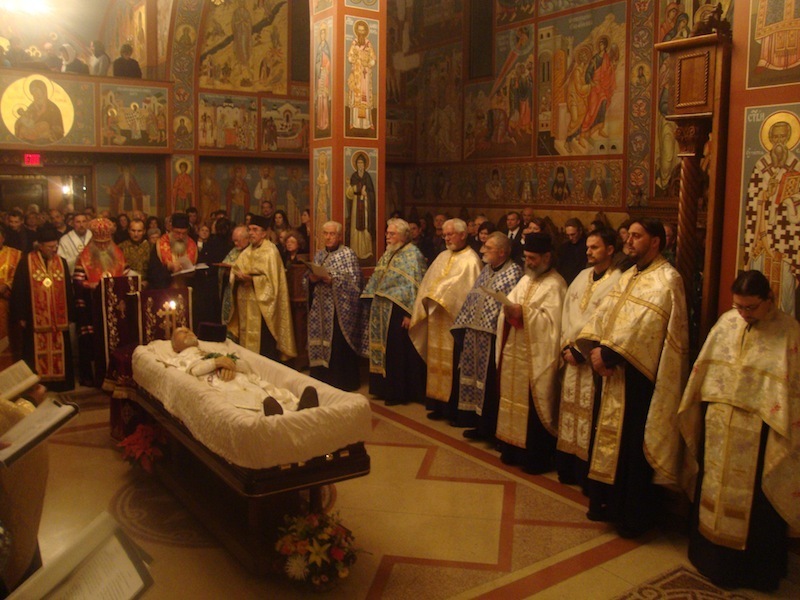 Although Prota Milan was one of the last of his generation, many former parishioners and friends of his and his family came to pay their respects, express sympathy and offer prayers for the repose of his soul as he lay in state in the Monastery Church. During this time, gospels were solemnly chanted by priests and deacons. 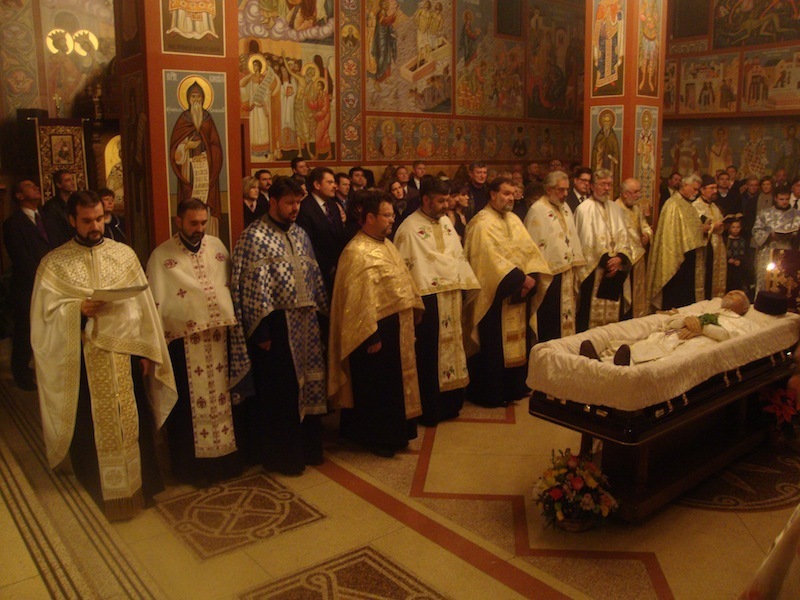 At 7pm that evening, the Funeral Service for Priests (Svestenicko Opelo) was served by Bishop Longin, Bishop Mitrophan of Eastern America and Bishop Peter of Cleveland (Russian Orthodox Church Outside Russia), along with over 20 Serbian and Russian priests and deacons. Also present were clergy from the Orthodox Church in America. 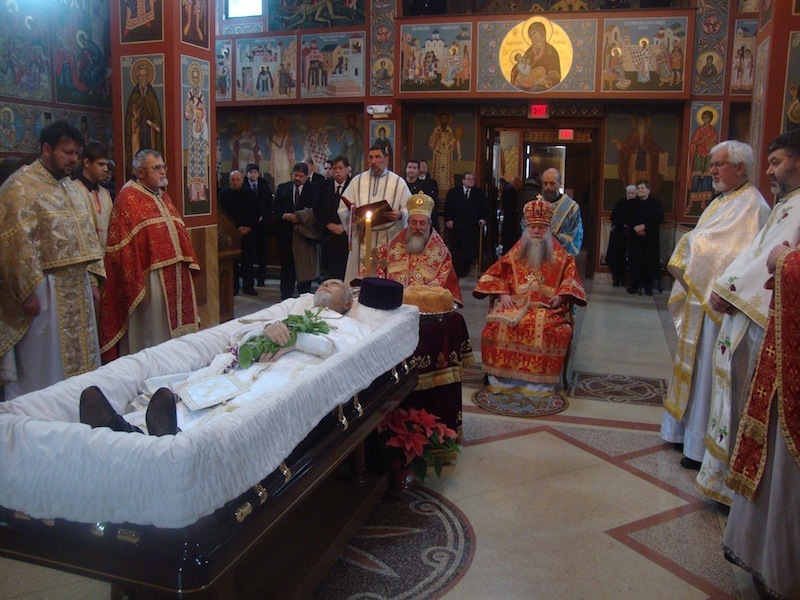 The Choir of Holy Protection Russian Orthodox Cathedral, Des Plaines, Illinois, under the direction of Dr. Michael Gill, sang the lamentful yet hopeful hymnology of the priest’s funeral service in Church-Slavonic, the language which both Prota Milan and Protinica Connie loved very much. The priests and deacons chanted the seven Epistles and seven Gospels and related prayers in Serbian and English with great dignity. Before the giving of the “Last Kiss,” Bishop Peter gave a eulogy in English, speaking of Prota Milan’s upbringing, education and dedicated service to the church for over five decades. His Grace also spoke of Fr. Milan’s spiritual formation during Seminary in Bitola, where Prota was educated by three glorified Saints of the 20th century: St. John Maksimovic, St. Nikolaj Velimirovic and St. Justin Popovic. His Grace Bishop Longin spoke in Serbian, speaking of Fr. Milan’s fruitful life in the vineyard of the Lord and dedication to His Church. He said that we should not sorrow as those without hope concerning death, but rather should think of his passing as an entrance into the eternal Kingdom of our Lord. This was something Fr. Milan spent his entire life focusing on – unifying with the Lord eternally. Bishop Longin stated that tangible evidence of Prota Milan’s firm belief in the eternal Kingdom and his steadfastness in the faith was the fact that all of his children were active participants in the life of our Holy Church. The following morning, December 1, Hierarchical Divine Liturgy was served at New Gracanica Monastery by Bishop Peter and Bishop Longin, as well as nine priests and two deacons. Also present were clerics from both the New Gracanica-Midwest Diocese and the Greek Orthodox Metropolis of Chicago. Responses were sung by the New Gracanica Episcopal Choir/Arhijerejski Hor, under the direction of Prota Milan’s daughter Marya Savich Milicich, which was joined that day by all of Prota Milan’s children and by many friends of the family. With over 20 singers, the Choir’s prayerful repertoire reminded those present of the beautiful services for which Prota Milan, Protinica Connie and the Savich family will always be remembered in Pittsburgh, Schererville and Lake Forest. 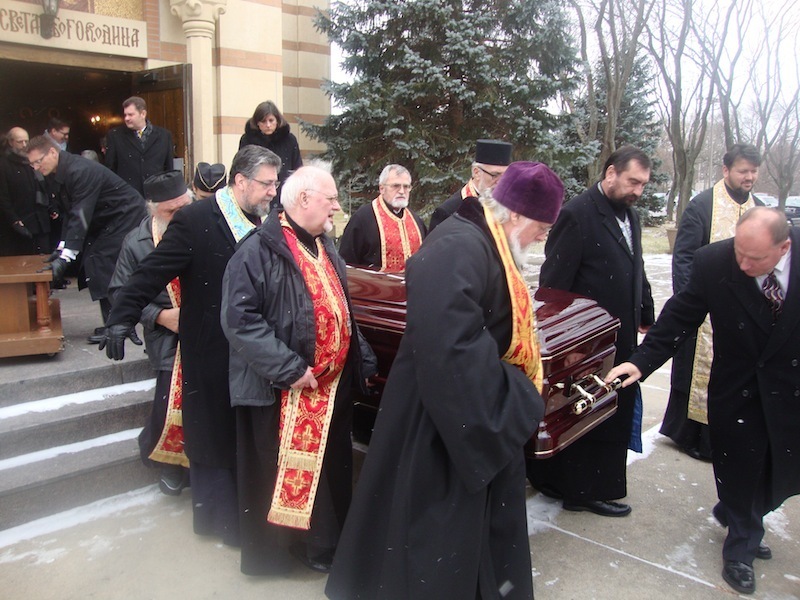 After Liturgy, despite the cold wind and first snow of the season, the Bishops led the outdoor Procession/Litija, during which his brother priests carried the coffin with Prota Milan’s earthly remains around the Monastery Church three times. 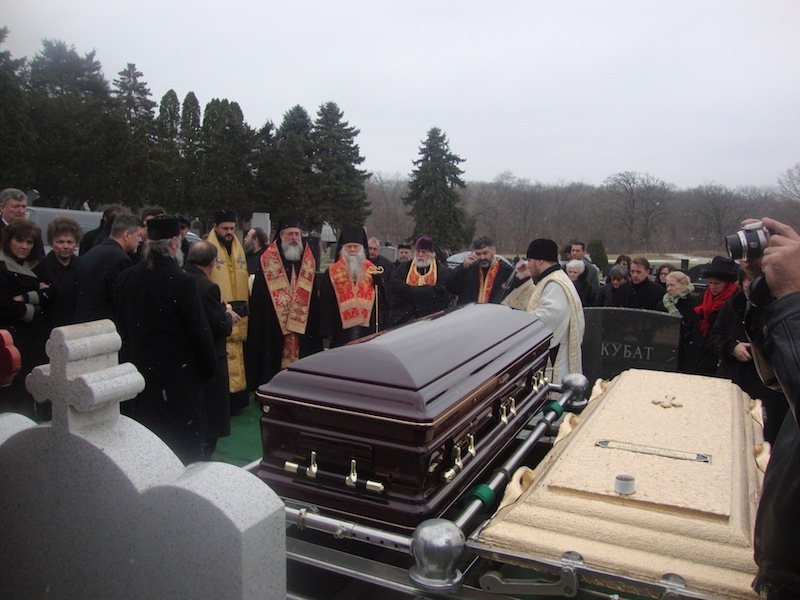 From New Gracanica, the procession continued to St. Sava Monastery Cemetery in Libertyville, Illinois, where His Grace Bishop Maksim of Western America joined Bishop Longin and Bishop Peter for the Pomen and Burial. Due to the extreme cold and snow, eulogies were not spoken at the cemetery but at the memorial luncheon/dacha, which was held back at the New Gracanica Monastery Hall. During the dacha, the family played a slide-show of photographs of Prota Milan’s life, which had been prepared on the occasion of his 50th anniversary of his Priesthood in 2003. 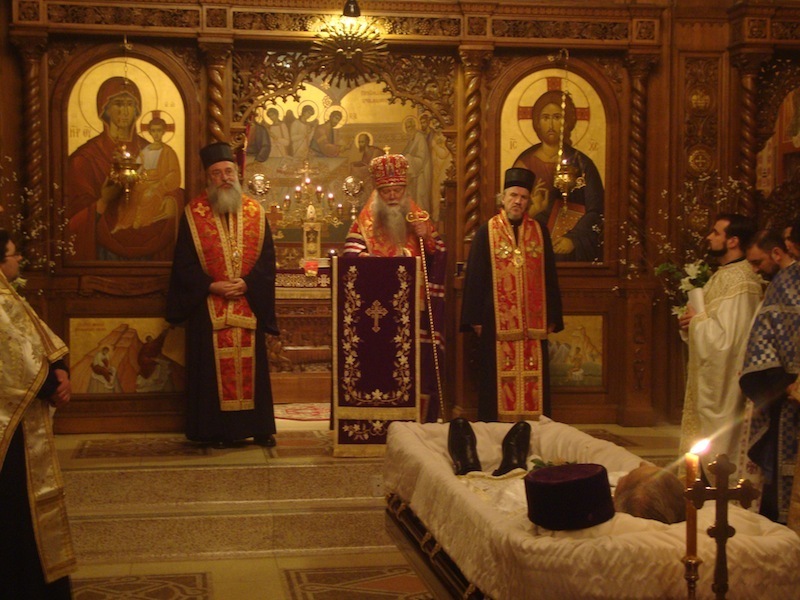 After the dacha, Protojerej-stavrofor Uros Ocokoljic, first cousin of Prota Milan, read expressions of sympathy which were sent by His Holiness Patriarch Irinej, His Eminence Metropolitan Amfilohije of Montenegro-Coastlands, His Grace Bishop Irinej of Australia-New Zealand, Protojerej Velibor Dzomic (Podgorica) and others. Prota Uros then went on to eulogize Prota Milan in Serbian, sharing the intimate memories he had of Prota Milan, their grandfather Prota Uros, their uncle Bishop Firmilijan and the struggles through which Prota Milan endured and persevered, honorably and with the utmost dignity. Louis-Ljubisa Milicich, son-in-law of Prota Milan, eulogized Prota Milan in English, focusing on all of the different ways in which Prota Milan remained on the Narrow Path to salvation during his long and fruitful life and how he refused to make compromises on his journey down this Narrow Path, which caused him to be remembered not as a “popular” cleric, but one who was respected for his steadfast devotion to his Church, his family, to his Serbian people and to his Orthodox brothers and sisters. Vice President of the Diocesan Circle of Serbian Sisters, Milly Terzic, eulogized Prota Milan for his years of service to the Kolo Sestara and for the personal spiritual example he set for her. 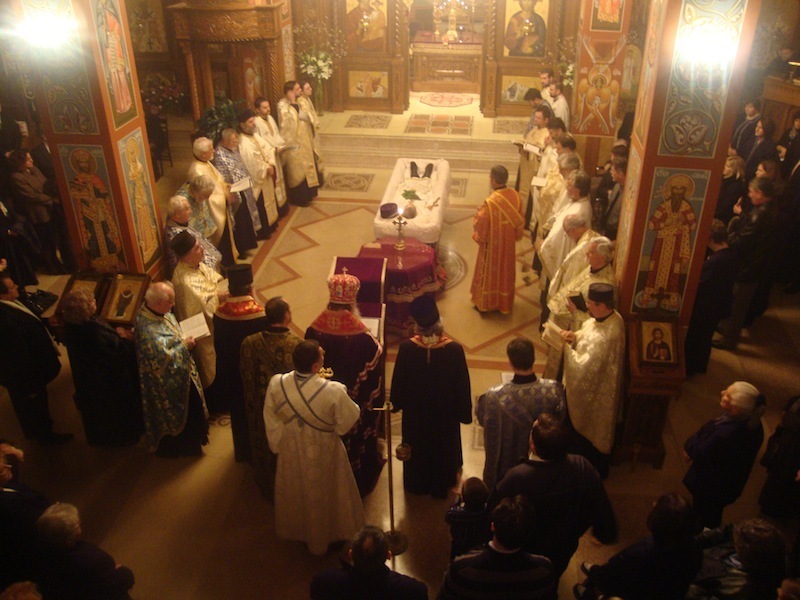 President of the Orthodox Clergy Brotherhood of Chicago, Archpriest Andre Papkov, expressed sympathy on behalf his brother priests, for the years service Prota Milan gave to the Clergy Brotherhoods in Chicago, Pittsburgh and Northwest Indiana. 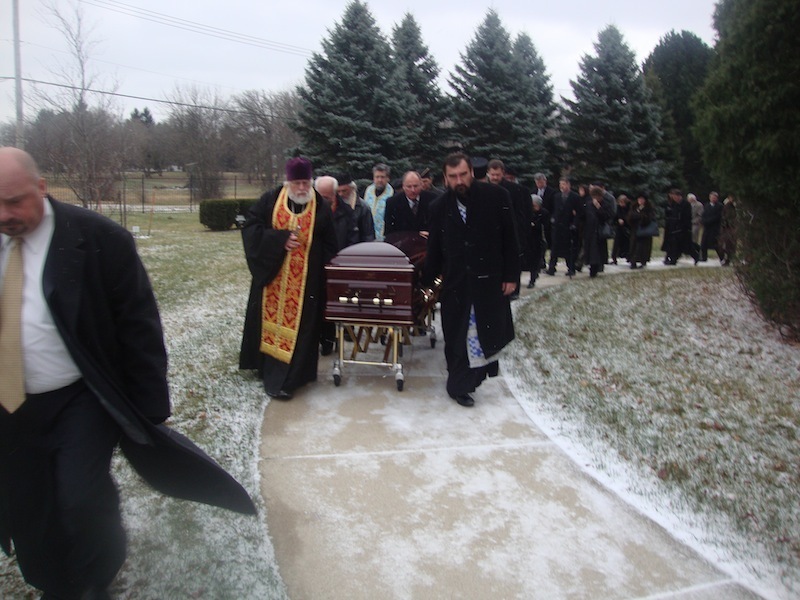 On behalf of the Savich family, his oldest son Jovan, thanked all present for making the effort to come to the funeral in the inclement weather, with special thanks to Bishop Longin for welcoming Prota Milan as a concelebrant at New Gracanica Monastery during the last years of his life. you have kept the faith (Timothy 4:7)!